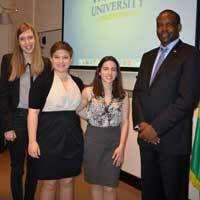 The International Relations Club and the International Relations Department at Webster University Leiden had the privilege of hosting Rwanda Ambassador Jean Pierre Karabaranga on Monday, April 11. Webster Leiden alumna and recruiter Olive Mukabalisa, herself a survivor of the genocide in Rwanda, led a beautiful ceremony honoring and remembering the tragic victims of the genocide against the Tutsi’s. 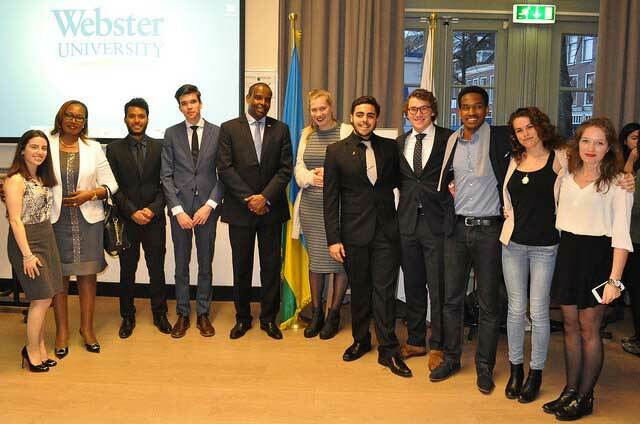 The event was co-sponsored by the Embassy of Republic Rwanda in The Hague. Karabaranga presented a lecture about fighting genocide ideology and then followed with a discussion session that engaged student attendees. The Webster Scholars assisted in the set up, cleanup and discussion portion of the event. The night was a huge success and shed light on this complicated and tragic time in Rwandan history as well as their steps in moving forward as a nation. View more photos of the event held at Webster Leiden on Facebook and in this Flickr album.